My baby’s growing up so fast. I’ve always known this car was special. Even the first day I saw it, so beat up the owner was about to junk it, I knew it could be salvaged if I put in the work. I strongly believed, and still do, that there was some serious potential, which is why we’ve been partnered up the last two years. As of three weeks ago, someone else sees that potential as well. 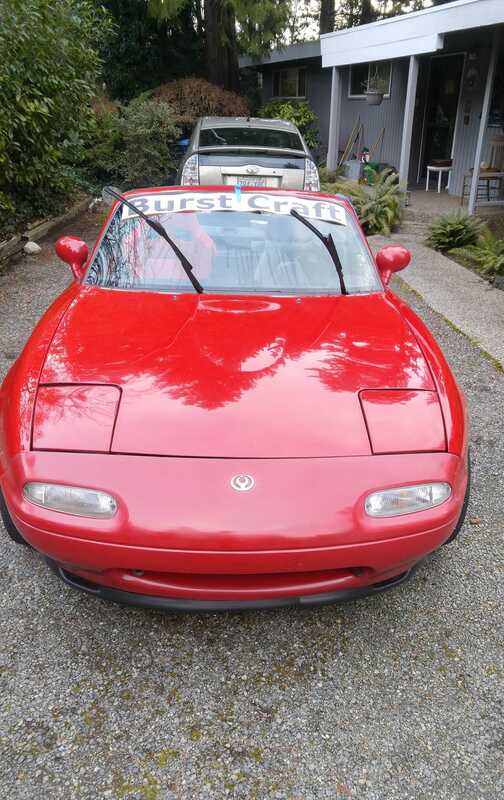 Say hello to Burstcraft USA, a San Francisco based shop dedicated to making Mazdas and Hondas turn heads on the street, and embarrass other competitors at the track. The owner’s a great guy who I’ve gotten to know fairly well over the past few months while working out the details of our arrangement. With a Miata, Integra, multiple bikes and at least 3 project cars at any given time he’s definitely our kind of people. We finalized the deal, and I finally got around to putting a logo on (now that it’s not twenty degrees out) and figured I’d try to get one of my new seats MacGyver-ed onto the stock sliding rails while the weather was permitting. Success! Unfortunately I still can’t have anyone sit in them while driving since there isn’t a harness/rollbar yet... but baby steps people! I’m loving the red on red, but everything else in the interior will be staying black. Also, the Brides are so much more comfortable than the stock seats it’s almost unbelievable.